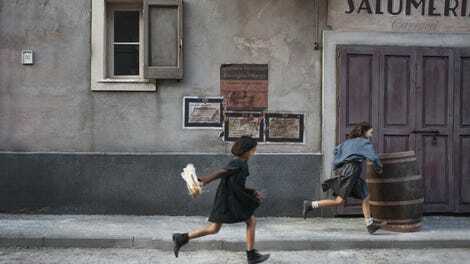 There’s precious little like contentment in “I Soldi (The Money),” the tense, taut second episode of My Brilliant Friend, but it’s not a non-existent quality. Moments of warmth, and even joy, bubble up on screen: Lenú and Lila retrieve their hoarded cash to buy a book and dream of better things; they read Little Women in the sun; they holler together inside a tunnel; Lenú reads Lila’s book on a sunny, breezy rooftop and marvels at her friend’s pail of words. All lovely. All peaceful. Each, in its way, a moment of tranquility and loveliness. This isn’t an idyllic childhood we’re witnessing, however. As such, these moments end almost before they can be wholly enjoyed, and some of them are not without an undercurrent of something sour or sore. Lenú’s family celebrates her excellent test scores as her mother’s resentment permeates the room. A book purchase isn’t just a moment of glee, but a possible escape route. And a long, gray road may or may not truly lead to the ocean, an adventure that may or may not be a joyful act of friendship. Director Saverio Costanzo makes sure these sour spots can be spotted from the beginning. After receiving a (pretty threatening, if we’re honest) cash gift from suspected doll-stealer Don Achille, the girls race off to hide their cash, unwilling to surrender it to their families and unsure of where it should be spend. Deliberate postponement follows, until Lila strikes upon an idea that will, she says, allow them to turn that bill into many bills. Mercifully, she doesn’t suggest that they get involved with some sort of child’s Neapolitan pyramid scheme, but instead announces that they’ll be buying Louisa May Alcott’s enduring novel Little Women, because reading that book will teach them to write one of their own. Sometimes the narration of a protagonist in voiceover can be a lot, even when it’s absolutely necessary to understand the events taking place or the emotional state of the character. (Example: Despite Caitriona Balfe’s excellent performance as Claire Fraser, the narration on Outlander is often more distracting than anything else. Some friends of mine call it “Claire-ification.” Not good.) Here, though, it’s indispensable, used extremely judiciously and always in beautiful language (often straight from the novel) that heightens the sensory experience while adding to the emotional and psychological layers already present. Such is the case with the older Lenú’s description of one of the qualities she most admired in her friend. Lila, she tells us (paraphrasing here) is a person who commits to her actions with every fiber of her being; even when the acts are small or intimate one, she follows through and takes no half-measures. It’s easy to understand what would be so alluring about that quality. If listening to Lila talk about words doesn’t make you immediately want to start writing a novel, who even are you? These are two exceedingly bright girls. Lenú downplays her own intelligence, emphasizing how her abilities pale in comparison to Lila’s jewel-bright, dazzling mind, but even that realization indicates a beyond-her-years self-awareness, as does her realization about Lila’s possible intentions on their ocean adventure and her ability to forgive her with ease. Two such brilliant minds should have no trouble making their way out of the pale courtyard to the ocean and well beyond, but the deck is stacked against them both, and one decision, hesitatingly made by one adult, sets the two friends on divergent paths. And that brings us back to Little Women, the opening lines of which begin this review. It’s not. The poverty of the families in Lenú and Lila’s neighborhood is never out of frame; both families balk at the suggestion that they pay money to lose help by sending their daughters for additional schooling. It’s an option not even available to some of their classmates, and it’s only the begrudging but determined acquiescence of Lenú’s father that sets her on a possible exit route. They are poor. They are girls. If there’s a way out, it’s a hard one, and only one of them comes close to finding it. The other gets hurled out a window for her trouble. In another coming-of-age story, Lila’s mother would defy her father to get her past that test, or her father would unwillingly bow to her brother’s demands. Her teacher would fight harder, or volunteer to teach her for free. She’d study on her own and win a scholarship. But this isn’t that story. It’s not even that story for Lenú, who endures abuse emotional, verbal, and physical in nature whenever the topic of school is raised. But for Lila, her only safe havens are her brother Rino (for whom, one assumes, she named the son who calls the adult Lenú in the first episode’s opening moments) and Lenú herself, the friend with whom she entrusts her book even as her jealousy and fear are apparent. From every other corner she meets violence and rage. Even her teacher, her champion, writes her off, and encourages Lenú to do the same. 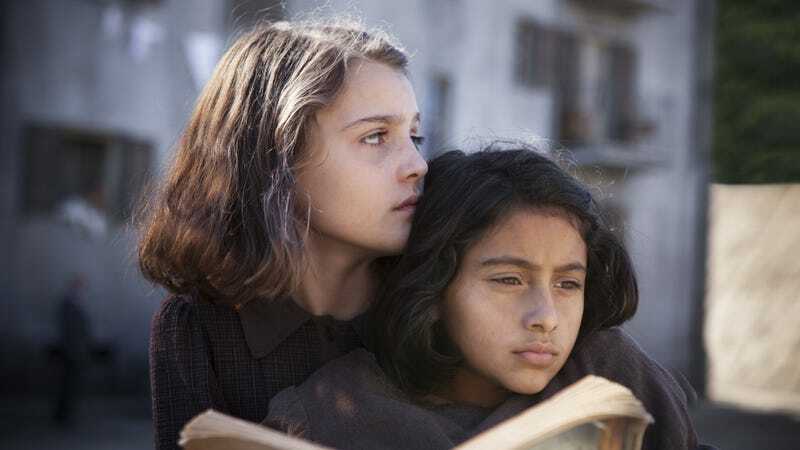 My Brilliant Friend makes very clear points about the many societal factors—financial, patriarchal, familial—that seem sure to keep one of these two brilliant friends from becoming what they have the potential to be. Yet it never stops being about the friendship of two young girls. Some of that is the writing, as the source material pulls this off with similar ease, and some of it is the direction, as Costanzo wisely sticks with Lenú and Lila even when their concerns have larger implications and resonances (no shots of dozens of little girls walking off to school, for example). But a great deal of it is due to the performances of Elisa Del Genio and Ludovica Nasti. It’s possible, even likely, that this will be the last episode that centers on these two—we’ve got to keep moving in time, and another pair of young actors await us as Lila and Lenú enter their teenage years. But they’ve done even more than was asked. They communicate the interior lives of their charges, and they make us believe in their bond, but they also lend all these big ideas and immediacy and urgency that’s not easily shaken. The saga of Don Achille and his neighborhood foes continues, with Lila seeming to piece together that Solara family was somehow involved in both the death of Achille and the subsequent arrest of their inexplicable but sure-as-hell convenient new hire. The violence is incredibly well handled. This episode is so, so hard to watch, because so much of what they experience seems routine. It’s only the window that seems to startle anyone—well, that, and Don Achille’s knife to the neck. The costumes, by Antonella Cannarozzi, are incredible. Every single one looks like it’s been tended to often, and like it’s not often cleaned.